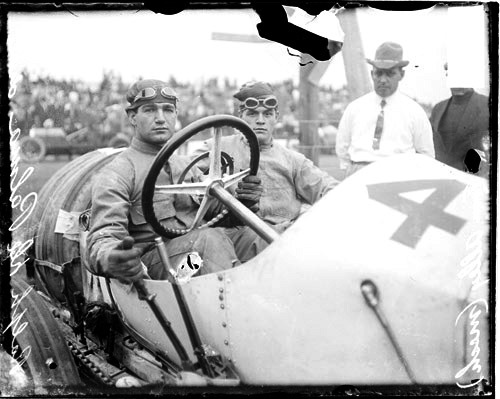 Ralph DePalma, an Italian-American driver who went on to win the 1916 Indianapolis 500, at the wheel of his car in a 1912 race near Chicago. His riding mechanic is Tom Alley. I like the ergonomic positioning of the levers. I suppose the spare tires indicate that this is a road rather than a track race. The photo comes from the Library of Congress' wonderful American Memory site (http://memory.loc.gov/). SDN-057946, Chicago Daily News negatives collection, Chicago Historical Society. On Wednesday I woke up about 6am and looked out the window. 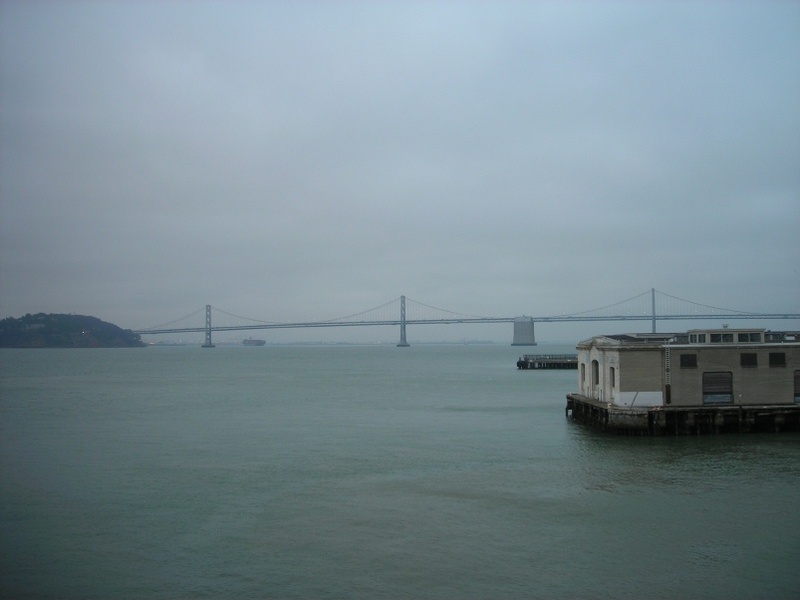 I saw Yerba Buena Island, the Bay Bridge, and the police boat. My daughter said she thought she had heard the engines stop for a while while we took the harbor pilot. I missed another chance to see us pass under the Golden Gate Bridge. My wife went to get her parents and my daughter and I waited by the dining room, where we had breakfast. We went to their cabin and grabbed their carry on items. On the way back to ours, we passed through the casino, which was thronged with people. It was one of the gathering spots for people to disembark. We headed down to deck 7 and waited in a quiet area for our turn to go through immigration, in the lounge at the stern. It went very quickly. The officers barely looked at our passports. We didn't have to go through customs because the amount on our declaration was far under $800 each. We went down to deck 5 and waited our turn to disembark. We had a color code (light blue 2) that indicated when we would get off and where we would find our luggage. Once in the Pier 35 shed, we found our luggage and then set out to find a porter. I finally learned that the trick is to find the ILWU supervisor. There was a massive crowd out along the Embarcadero. We helped the in-laws flag down their ride, then waited for our car. 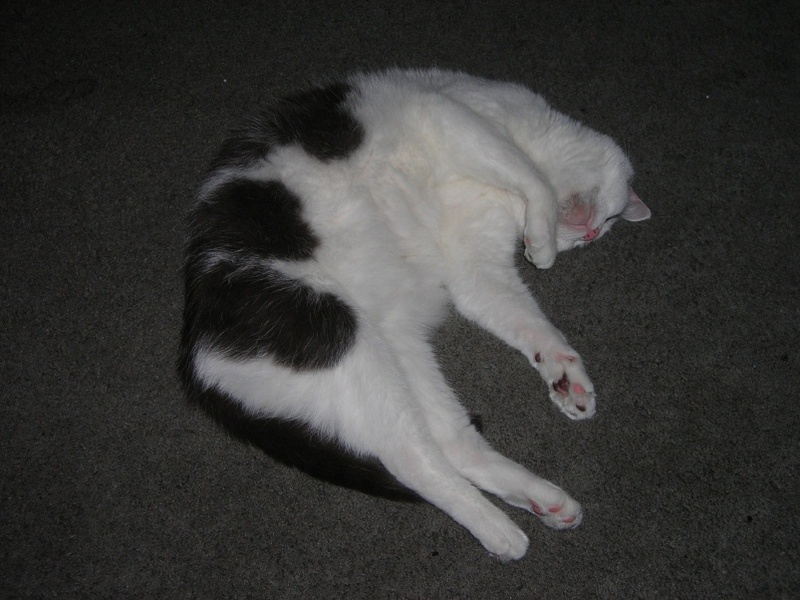 When we got home, we found the cat in a remarkably good mood. My favorite part of any trip is getting home and sleeping in my own bed. We might do a cruise again some day. Not to Alaska from San Francisco -- too long. Tuesday was our last full day on the cruise. We were ready to get home. Here is view over the bow of the Dawn Princess. In the morning we attended a cooking demonstration by the chef and the pastry chef. Then there was a galley tour. The galley was remarkably big, and it was one of four. We spent the rest of the day packing. They asked us to put our bags in the corridor between 8 and 10pm. We did ours, then help the in-laws with theirs. I don't remember sleeping very well. The Giants beat the Dodgers yesterday. We spent much of the day packing. 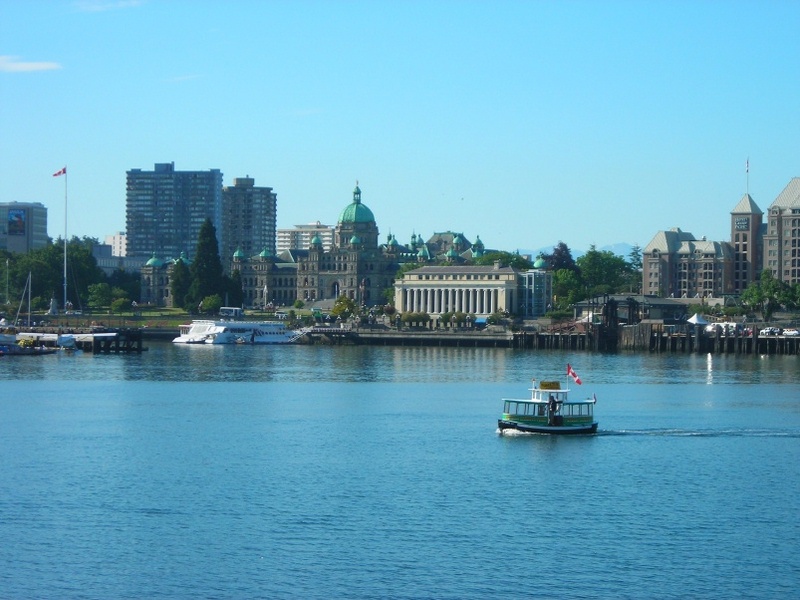 On Monday we woke up in Victoria, British Columbia. My wife and daughter both felt this was their favorite port. Sadly, we were only there from about 6am to 2pm. This was the first really sunny day of the whole trip. Canadian officials did not look at our passports when we got off the ship or got back on. We caught a shuttle bus from Pier A to downtown, across the street from the Empress Hotel. We stopped to look at the Inner Harbor (Harbour?) then crossed the street. A friendly doorman let us take a look around the Empress. We walked up Government Street and found a nice coffee shop called Mirage Coffee. I had hot chocolate and an apple croissant. We continued walking out Government, past shops that were mostly closed. We noted three Starbucks within a few blocks. There were many nice old buildings. People were friendly in general. A man saw us looking at a map and suggested places to visit. I do a lot of that in San Francisco. I saw a sign about a program for local people to greet visitors. We paused to look around Chinatown, which was rather small. We went down by the Via station, then crossed a drawbridge, where I took this photo of the Inner Harbor. We went back to Government Street and visited a Starbucks to use the restroom and wait for more shops to open. My wife and daughter visited various stores. My daughter particularly liked a tee shirt shop named Utopia. On the way back, we stopped at a large shopping mall. Unlike malls with which we were familiar, there didn't appear to be a big anchor tenant. We had lunch upstairs in the food court and had a chat with a local lady about our cruise. We took the bus back to the pier, and found some deck chairs facing the stern to watch the ship sail away from Victoria. Right after we backed away, we saw a small, red hulled boat making all speed towards, seemingly trying to cut across our stern. It turned out to be the pilot boat. This was the only time I got to see the ship take the pilot. I don't remember much of the rest of the day, except that we were anxious to get home. We did not get to do high tea in Victoria, so we went on the ship. We were forced to go to the atrium at 11:30pm to watch some sort of a ceremony where the poor waiters made a huge pile of champagne glasses and the maitre d' assisted people in filling them from the top. I felt bad for the waiters, all of whom had worked breakfast, lunch, and dinner and many of whom had also done afternoon tea. On Sunday, Monsignor Bruce Dreier of Saint Robert's in San Bruno said mass in the lounge at the stern. He asked for volunteer readers, so I did the first reading and my wife did the responsorial psalm. It was a nice service and lots of people showed up. After, we couldn't find a table that would fit us and the in-laws in the buffet. We spent the whole day at sea and I think many of the passengers were going stir crazy. People were very excited when we began to see land, along Vancouver Island. I think after a week on the ship that entropy was setting in. There was a stain on the tablecloth at dinner. Bits of the ship seemed dirtier. Above is a shot of our cabin after it had been made up for the evening. We found it convenient to move the ladder to the foot of the upper bunk. Our cabin attendant, Eddie, did a remarkable job of keeping the room clean throughout the trip. My daughter and I took some time to further explore the ship. We found the black box in the afternoon. I was very anxious to get home. Last weekend, the Brewers swept the Giants. During the week the Giants swept the Nationals. This weekend, Arizona swept the Giants. Sigh. On Saturday, I set the alarm for 4:45am (!) so we could see the ship enter Tracy Arm Fjord. 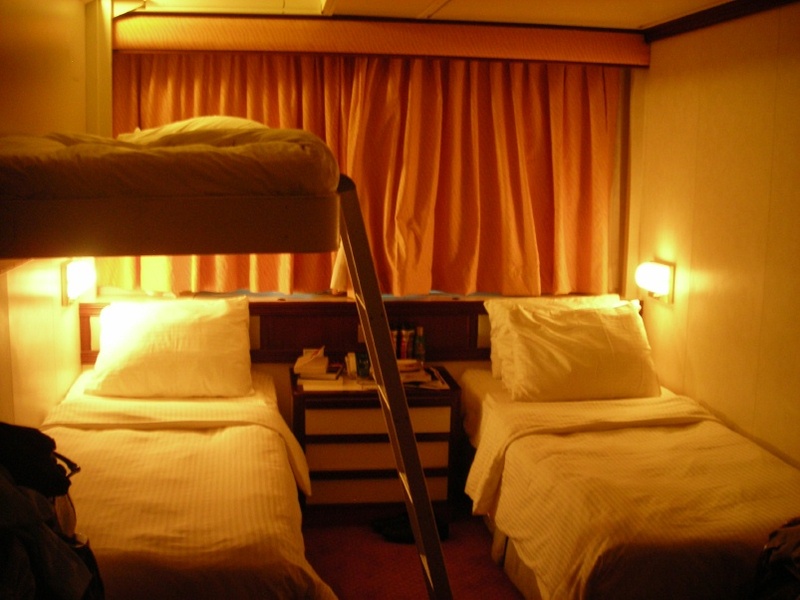 Our daughter chose to stay in her bunk, but my wife and I dressed warmly and went down to the promenade deck. The naturalist never mentioned the outside temperature and I was happy he did not. As we crossed the morane bar at the mouth of the fjord, we saw some whales. As we passed up the fjord, we saw more and more floating ice, which had a pretty blue color. I was impressed by the resemblance to Yosemite. I took the photo of the waterfall on that morning. We stopped at a point where we could see a glacier up a branch to starboard. The naturalist said the face of the Sawyer Glacier was up a branch to port. We couldn't proceed any farther because of the ice. We drifted in place for about 30 minutes, then headed back. I spent the rest of the day getting warm and exploring the ship. My daughter and I found the black box in the afternoon. At dinner we found it was French Night (why not on Bastille Day?). I had the snails for my appetizer and frogs' legs for the entree. No one else at the table ordered either. I got my wife to try the frog and she enjoyed it. On Friday, 11-July-2008, we awoke and looked out the window at Skagway's famous Ore Dock and Ore House (!). When we were up and dressed I looked out to starboard and saw a string of White Pass and Yukon passenger cars, spotted below a cliff covered with graffiti left by the crews of many ships that had called at Skagway. We were on the second section of the three-section morning train. It was pulled by a pair of shovel-nosed GE locomotives, flanking an ALCO. The first section was for people from the Coral Princess, which was docked behind us. Our companions on the train had mobility issues, so we were in a handicapped-accessible car. I didn't write down the number. The wheelchair lift worked smoothly and lifted them right in. My daughter and I climbed up and the next car and crossed back. There were three wheelchairs and a mobility scotter aboard. There were rails in the floor so that seats could be added or removed. We enjoyed looking at Skagway as the train rolled out of town. My wife said it looked like a place where people really live. Once we passed the town limits, they announced that we could stand on the platforms as much as we wanted, as long as we did not cross between cars. I spent most of the trip on the platform, watching the waterfalls and catching glimpses of the other two sections. I missed the bear. I'll write more about the train trip on my Park Trains and Tourist Trains page (http://www.cable-car-guy.com/ptrain/index.html). When we got back to Skagway, we pulled off the main line and into the station. Our companions insisted that we get off while they rode back to the ship. We later learned that because of the area's severe tides, it took a lot of assistance to get them aboard. We walked around Skagway, visiting various businesses along Broadway, including the Sweet Tooth Cafe. We picked it because it reminded us of Bill's Place in San Francisco. We wanted simple food after all the fancy stuff on the ship. My wife had fish and chips and my daughter and I had grilled cheese sandwiches. We had a nice walk back to the ship, but I learned why the Tlingit name means "place of the winds". It got to be very windy and cold. Skagway was our favorite port in Alaska. I took the photo in the White Pass and Yukon station. Please excuse the recent interruption. I've been ill this week. I'm feeling much better now. Nothing to do with the cruise. A nice lady took care of the cat while we were away. If anyone is interested, please email me and I'll provide contact information. I took the photo on 03-July-2008. Next week we have to take the cat to the vet to find out why her chin looks dirty. On Thursday we woke up in Juneau. We were at the AJ pier, so we had to take a shuttle into town. It was $1.50 for unlimited rides. If it had not been raining, we could have walked. The shuttle let us off next to the station of the Mount Roberts Tramway. The family visited a couple of stores, then we rode the tramway to the top. It was very foggy, so we couldn't see much. The ride was exciting, about 3000 feet, almost straight up. We visited the Nature Center and they bought some books that will be useful for reading to students. We saw Lady Baltimore, a bald eagle who had been shot and can't be returned to the wild. We were impressed by her size. We walked up the trail a bit, and our daughter got to walk on snow, but it was slippery, so we turned back. 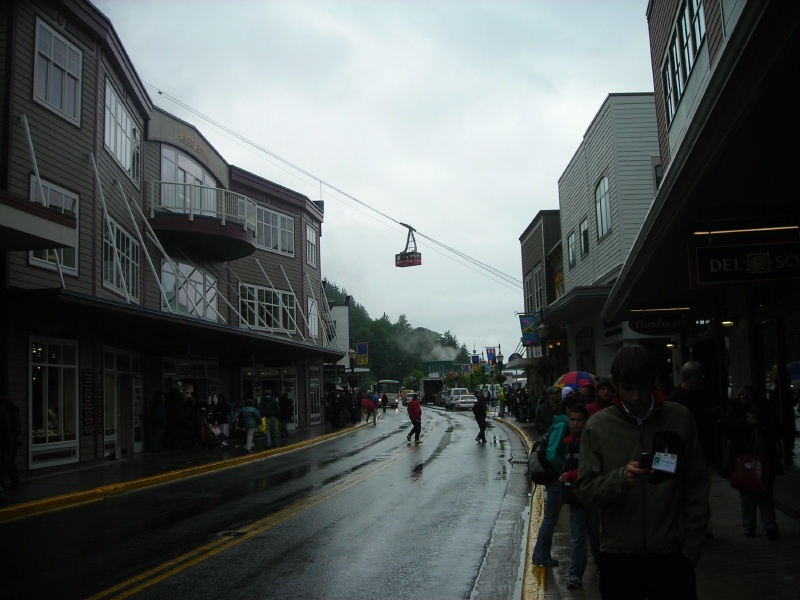 We took the tram back down and took a walk into Juneau. The Red Dog Saloon was too much of a tourist trap. We worked our way up to the state capitol building, had lunch, and stopped at the Alaska Hotel Bar for a beer. It was a nice dark, old-fashioned place. My wife felt that Juneau seemed more relaxed than Sacramento. I visited the atm again and I think had two legislators behind me. We took another ride up the tram and could see as far as the ship. I'll probably write more about it on my cable car site (even though it is not a cable car). We took the shuttle back to the ship. One poor couple was trying to get to the Coral Princess, which was at another dock. The driver said he would take them back to town. 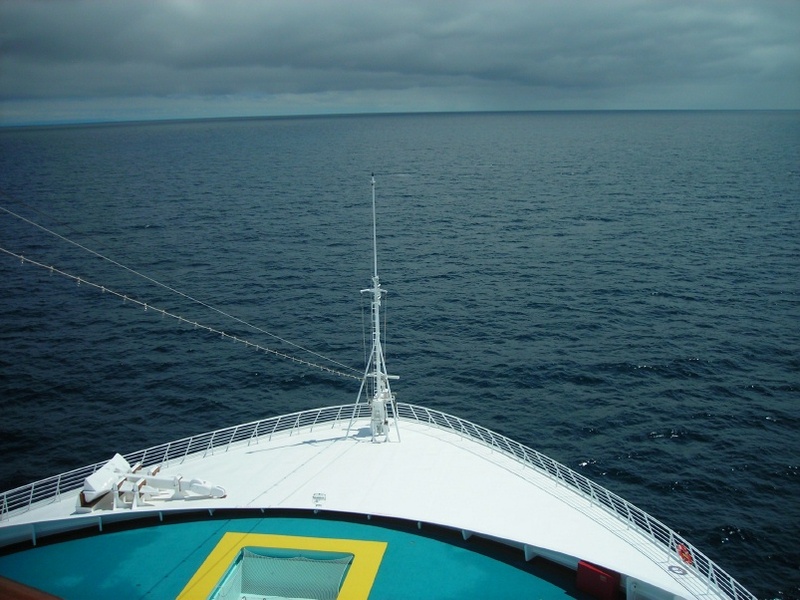 The tides in the area are massive, but we were able to reboard on deck 5. I went out on deck and got some nice photos of float planes taking off and landing. The Giants traded Ray Durham to the Brewers. He was a good player. The Brewers swept the Giants. On Wednesday we woke up very early and looked out the cabin window. No land. Soon after, however, we started to see low islands. 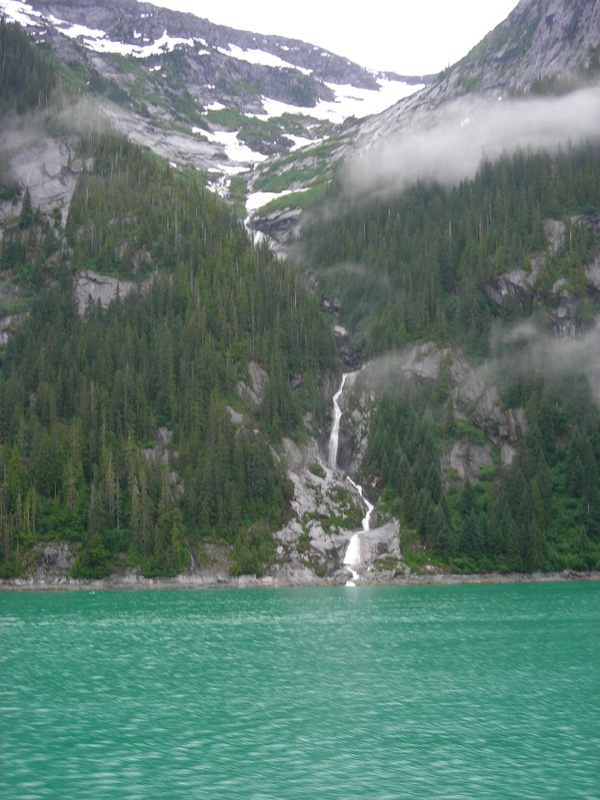 The captain had announced that we would arrive late at Ketchikan. When we got down to Deck 5, about an hour early, a line had already formed. By the time they allowed people to disembark, the lobby was jammed. Repeated announcements asked people not to go to Deck 5. No one cared. I have read that it rains 300 days a year in Ketchikan. This was one of those days. We found three other cruise ships in port. We visited a gift shop near the pier, then moved on to look for a store that the naturalist had recommended: Ketchicandy. We picked up some chocolate-covered Oreos, which were as good as he had said they would be. We moved on to the Wells Fargo branch to patronize the atm, then proceeded to Creek Street. I wanted to take photos of the funicular, which leads up to the Fox Point Lodge, a restaurant. Beyond the funicular, the street reminded me of Sausalito during a flood. We wandered around a bit more. My daughter was shocked when I pointed out the store that sold reindeer sausage. We stopped at a coffee place (I didn't note the name) and had something. My daughter expressed a wish for a proper cookie. She pointed out that there was nothing like that on the ship. We had had about enough Ketchikan, so we stopped at another store near the pier, then reboarded the ship. This required scanning our cruise card and passing through a metal detector. When the ship sailed, the naturalist talked about what we were seeing. I enjoyed seeing the rest of Ketchikan spread out along the water. Almost everything is built on piles. I saw some bald eagles and two ships of the Alaska Marine Highway. We saw a couple of whales, and he said there would be whale watching at about 7:30. After dinner, we went out and saw more whales breaching and sounding. 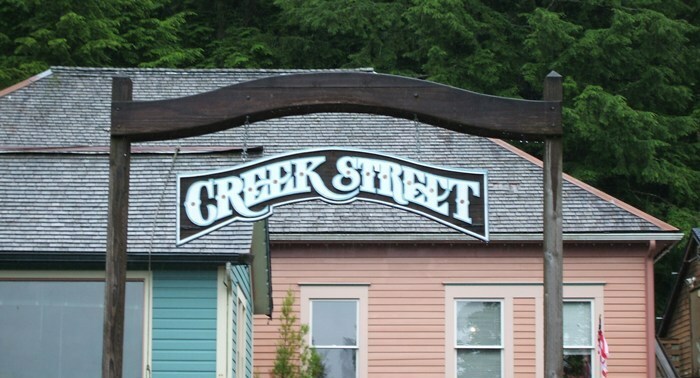 My daughter took the photo of the Creek Street sign. All rights reservered. Last night we went to the ball park to see the Giants play the Brewers. Before the game there was a crab feed in the parking lot to honor Crazy Crab. We received a Crazy Crab bobble head and a good crab sandwich. We did not wait for the guest of honor. We each got another bobble head when we entered the park. Our seats were in the very top row of the upper deck section behind home plate. The wind blew through the arches and the green material stretched across kept banging me in the back of the head. The temperature reminded me of Candlestick, but all the flags were blowing the same direction. Crazy Crab ran across the field once and showed up on the video screens during the 7th inning stretch. CC Sabathia almost had a shutout. The Brewers won 9-1. This was our second full day at sea and the family continued to grow antsy. The seas grew calmer but we got more nervous. I enjoyed walking around the promenade deck, deck 7. 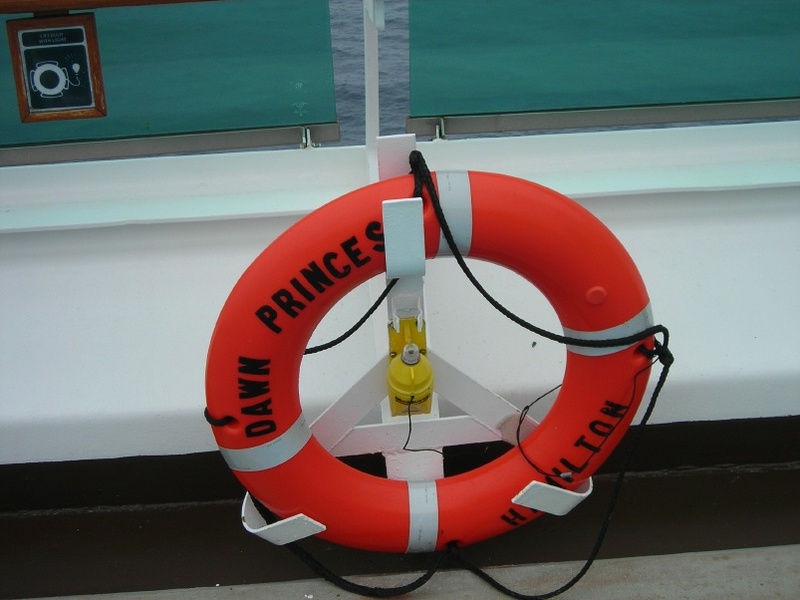 That is where I took this photo of a life preserver. I like the emergency light attached to it. In the morning we attended a presentation by the resident naturalist, Allan Cortash (? ), on whales. We enjoyed his style and learned a lot. Later we sat in the library. My wife and daughter played Scrabble. I had not brought my book, so I looked out the window and watched as the horizon rose and fell above and below one of the rails. I served as the Scrabble dictionary. One night (that night?) we went to hear a British guy named Brett Cave who played the piano, sang, and verbally abused people in the Atrium lounge. He played many Van Morrison and Elton John tunes. His schtick is to force people to sing along. He led a very difficult game of "Name That Tune." Everyone was desperate to reach land. Tomorrow: Ketchikan. After a rough night, my wife and I got up in the morning and went up to deck 14 by the aft elevators. We opened the door and were nearly blown down. We worked our way up to the buffet and had coffee. Later we saw signs like the one above posted on the windows. The sea was covered with whitecaps. 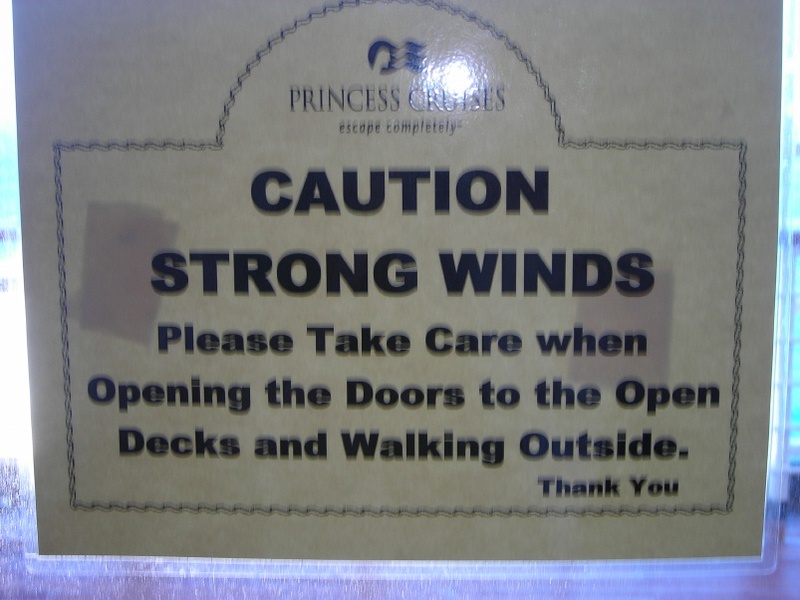 The log we received at the end of the cruise said the winds were Force 10 that day. Our daughter felt better when she got up. My mother-in-law has always wanted to win at trivia, which appears to be a big event on cruise ships, so she was hoping she could do well with our help. We had to compete several times and helped her to win passport holders and luggage tags. Bad things often happen when I play trivia, but nothing this time. Monday was the first formal night. At dinner we found two new people at the table, two gentlemen from Walnut Creek, married four years. Nice people, but one wasn't feeling well. Everyone looked nice. After, we posed for photos with the in-laws. We took our daughter to a night club called Jammers for drinks. By the end of the day, the seas had grown calmer. I didn't get to read as much as I had hoped. I started with Jack London's The Call of the Wild. It seemed appropriate. We just got back from a cruise from San Francisco to Alaska and back (thank Heaven) to celebrate the in-laws' 50th wedding anniversary. I thought I'd write about it one day at a time. On Sunday, July 6, a car came and picked us up at 11am. The driver took us to Pier 35. An ILWU porter grabbed our bags and explained "I'll go through that door and you'll go through this door." We went in and got in line. We had to show our passports and we received simple forms to fill out. We sat in a small waiting area while filling out the forms, then got into another line, which went quickly. We got checked in there and sent over to another area, where they took a group of us and boarded us. We found an elevator to deck 8, and followed the signs through the pizza place, the atrium, and the casino to our room. My wife was shocked to see how small it was. My daughter couldn't see her bed. I explained that the room had not been made up yet. The view out our window looked between lifeboats 14 and 16. We met the in-laws and went to the buffet for lunch. The safety drill was all on recorded audio. There were three muster stations on deck 7, in the lobby of the theatre forward, in the Atrium amidships, and in the Vista Lounge at the stern. That was our station. We grabbed our life preservers and headed down there. The captain announced more than once that people should make sure not to drag their straps. We put on the vests at the end and they encouraged us to take photos. We went to deck 14 (there is no 13) for the sail away party. I was looking forward to watching as we sailed under the bridge. We waited and waited after the 5pm time we were supposed to sail. Captain Marco Fortezze (a Genoese) announced that all passengers were aboard, but they were looking for a member of the crew. We had to head down for our 5:30 dinner seating. We sat at our table with the in-laws and a nice couple from Stockton. The waiter and assistant waiter, Valentino and Raul, were very good. The food was fancy, but not all of it was thrilling. Later we unpacked in the cabin. The trip was rough and my daughter was a little unwell. She didn't sleep well as the ship started to porpoise as we ran north against the current. 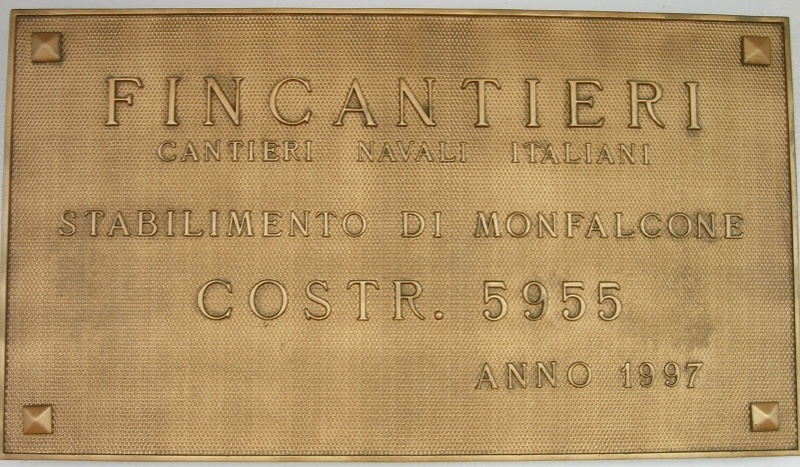 I took the photo of Dawn Princess' builder's plate on 09-July-2008. Even though she is only 11 years old, she is considered to be too old and too small. Tomorrow: A day at sea. Here is the sixth part. He continues to discuss his career as a photographer. His son Henry Van Der Weyde served in the Union Army during the Civil War and later emigrated to England, where he worked as a photographer. I have not located a photograph by PH, but the image this month was taken by Henry. 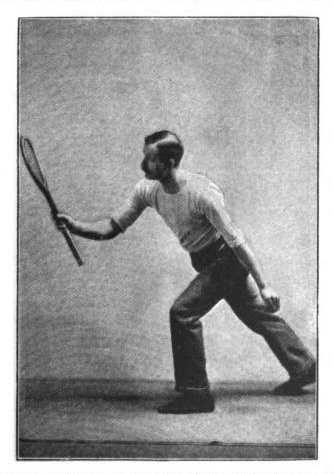 It is from Tennis By John Moyer Heathcote et. al: "C. Saunders volleying the service from the pent-house." Roger (or Rogier) Van Der Weyde was a Fifteenth Century Flemish painter. (5th. Career as a Photographer. -- As stated before, I began to follow Daguerre’s advice, and made only pictures of outdoor objects. The first subject was a chimney top, visible across the street from a top-story window. This was very much admired, especially because it exhibited a peculiarity never before seen in art productions, namely, that every brick was represented, with details which required a magnifying glass to verify them; defects in the bricks, for instance, only visible by help of an opera glass, were found in the small picture when a magnifying lens was applied. I went a step further, and attempted to make a picture of an object only visible by a telescope; this was a church spire at the horizon of an extensive fiat landscape seen from a window in the attic story. At first nothing of it was visible on the Daguerrean plate, not even by the strongest lens; but by narrowing the diaphragm which I used in front of the lens, and prolonging the time of exposure in proportion that the light reaching the plate was thus reduced, I succeeded in making an impression of the invisible spire, very distinctly recognized by the aid of a small magnifying lens. This also was another feat admired by my friends. This, and similar experiments, set me speculating in regard to the future services which photography might render to astronomy, if at night it might not be possible to photograph invisible stars by long exposure to a camera attached to the heliostat, of which I had studied the illustrated description in Gravesande’s ”Elemens de Physique,” published in Leyden in 1744, plate 83, pp. 127-136, having its clock-work motion so regulated as to follow the movements of the stars, and so make a very long exposure possible -- say several hours. When speaking about this to some friends, they said I was a visionary; but when I mentioned the subject to an old astronomer, he answered that if I lived long enough I might see this done. (Warning – Large pun ahead – JT) I thank my stars that I have reached the age to see such experiments of photographing constellations carried on as a regular practice in first-class observatories. Notwithstanding the public in general had not the least idea of what photography promised to all whose mind was prepared to conceive the diversity of its applications, it is scarcely possible to realize the general surprise and delight produced by the new art, which at first had many doubters, who could not believe in what seemed to them almost miraculous results, until at last they were convinced by seeing an operation which at present (only fifty years later) has become so common that daguerreotypes are made by the nickel-in-the-slot process, and this often in some dark corner with the aid of electric light. This is another illustration of the material service which the sciences and arts can render to one another. The nickel-in-the-slot process has perhaps reached its most extensive application in Coney Island, in regard to which locality we in New York are in doubt if we should be proud, or, on the contrary, should be ashamed. One thing is certain, that those who there practice this art for a living, ought to be ashamed of the pictures they produce, as well as those who indulge in that luxury and who exhibit them to their friends. This reminds me very naturally of a few other localities where photographs are made by help of electric light. However, while Coney Island is low in the estimation of lovers of science, art and refined culture, the other localities stand high -- stand at the top of the pyramid with which we may compare the sum total of science and art. These localities are Paris and London. I have the satisfaction of knowing that my oldest son, Henry Van der Weyde, was the first to introduce in London, and also in Paris, the use of the electric light for making photographic portraits. As he never studied photography, it may be of interest to many to know how he succeeded in outstripping the photographers of those two cities. From early boyhood he exhibited a strong predilection for drawing, at which I was not at all surprised, as it is a family trait*, of which I was possessed myself; and so I did with him as my father did with me -- namely, helped and encouraged him, giving him at an early age a good teacher, and sending him later to a drawing class, where he studied statuary and living models. He became soon very expert in painting miniature portraits, for which he easily found profitable employment in New York among the leading photographers, until the civil war broke out, when he joined the Seventh Regiment, N. G. S. N. Y., to leave for the protection of Washington, and later served in other regiments to the end of the war, when he returned with the rank of Brevet-Major, and, unlike others, he returned at once to his former occupation; as in the meantime I had moved to Philadelphia, having been appointed to a professorship in Girard College, he found an engagement with Gutekunst, the leading photographer there. * The old master Roger Van der Weyde is one of the ancestors of the family. 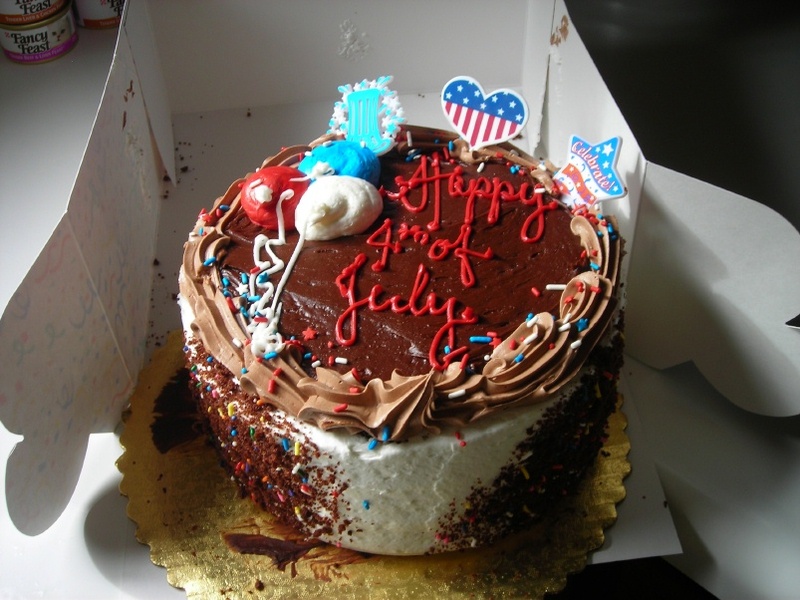 This is a cake we bought from Mazzetti's Bakery in Pacifica. Another view of Company 35 at Pier 22 1/2, Embarcadero and Harrison, the home of the San Francisco Fire Department's two fireboats, Phoenix and Guardian. The station was built in 1915. 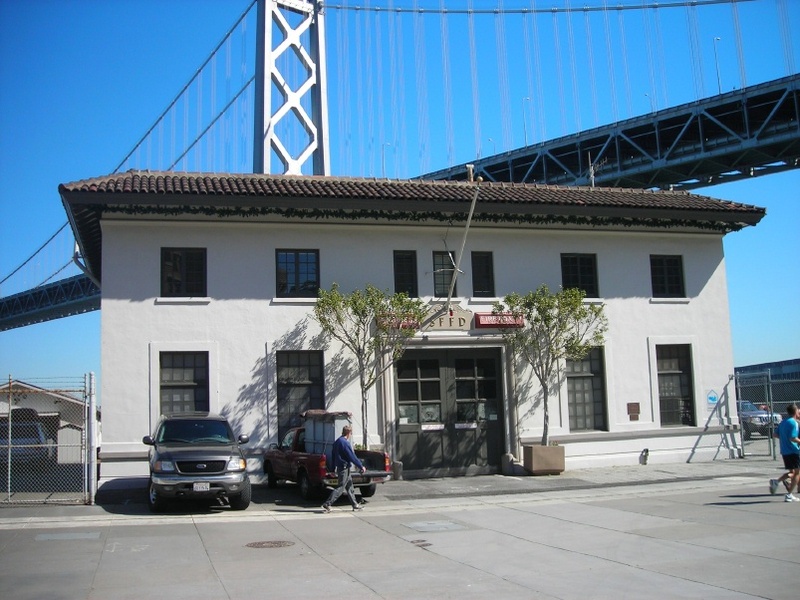 From the Report of the Department of Engineering of the State of California, 1917: "A fire house for the use of the San Francisco Fire Department, located on the bulkhead wharf between Piers 22 and 24. This is a two-story timber building, 38 feet by 62 feet in size, covered with cement plaster and containing a garage for a motor drive engine, with living and sleeping rooms for the company. This building was completed in April, 1915." In other news: I was sad to hear on the radio this morning that Jules Tygiel, baseball historian, had died. I took California History from him at SF State. Baseball came up a lot. He was a good teacher and a good writer. 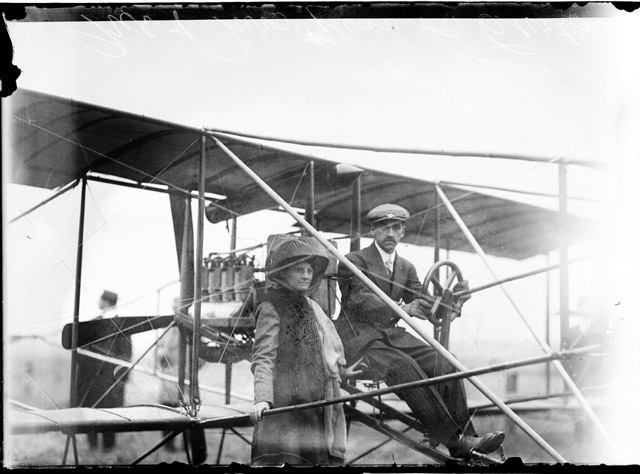 Pioneering aviator Glenn Curtiss and his wife Lena in 1909. Curtiss was a daredevil who survived motorcycle racing, flying, and Florida real estate development. He got involved in aviation because he had designed lightweight engines for his motorcycles. The photo comes from the Library of Congress' wonderful American Memory site (http://memory.loc.gov). DN-0007818, Chicago Daily News negatives collection, Chicago Historical Society.